4. Learning how to make ganache properly. What you do is; pour warm cream over finely chopped chocolate rather than adding the chocolate to the cream. I have been doing this wrong for years! Thanks Jamie magazine for the handy hint. 5. There is nothing like British Vogue to brighten up a gloomy day. End of discussion. 6. Gifs of Andrew Garfield like this one. Look at that face. 7. Kiwi Yo. I finally visited their Mission Bay store yesterday and i must've told so many people about it since. 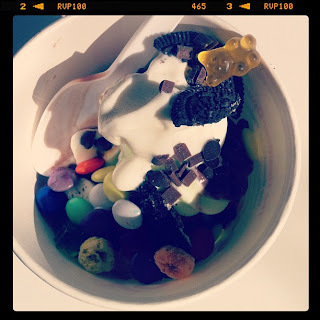 You choose your fro yo (I combined mint with chocolate) and then add whatever toppings you like. There are sweets, chocolate and even sweet cereals to choose from. You pay for the weight of your cup and mine (see above) only set me back $4.80. Did I mention it tastes amazing? I can't wait to go back. 8. On Instagram? Go and follow my friend Jess of @FoxesShop. She posts the most adorable photos. 9. I will be writing fortnightly posts over on Hazel Loves Design blog. Expect to see more about Fashion+Beauty there. Posts will be going live on Monday's and I'll be sharing the links over on my Facebook and Twitter pages so like and follow me if you haven't already. 10. Moonrise Kingdom which I am watching tonight as part of the New Zealand International Film Festival. I can't wait to finally see this with Britney and G. Pretty costumes and a gorgeous storyline + setting seem guaranteed from the trailer. I'm excited already. *Unfortunately I won't be attending NZFW this year. This was an extremely difficult decision to make but I need to reorganise my priorities at the moment. I will still be sharing NZFW content with you all & hope that I will be there next year.